“What belongs to the people is homes, not tents,” said Stella August at the Carnegie Community Action Project’s (CCAP) second Town Hall meeting on the housing crisis and what to do about it. “It’s really important to fight and to continue to fight. We really need justice here,” added August. Downtown Eastside residents are working on a campaign to get more social housing at welfare rate, keep and improve SRO hotels, and get real rent control. The actions are coming out of two meetings, a packed town hall meeting in the Carnegie Theatre on Jan. 9 and another strategy meeting on Jan. 23. As a result of the meetings the group is working on a strategy to get the city to put 100% welfare rate housing on 10 sites, 6 of which it already owns and 4 that it can buy. 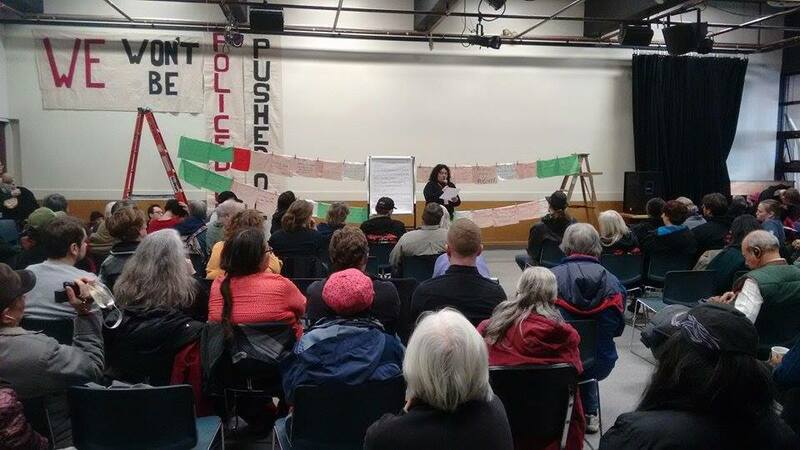 At the meeting on Jan. 23 the group talked about developing a community vision for 58 W. Hastings that would include a housing mix that could be one third Chinese seniors, one third Indigenous and one third other DTES residents who are homeless or live in SROs. All rents would be at the welfare shelter rate or 30% of income and no one would be turned away because their income was too low. The residents themselves could run the housing. The ground floor would be for community uses, maybe an art space for real low-income artists. The building would also have cultural spaces for the Chinese and Indigenous people who live there.